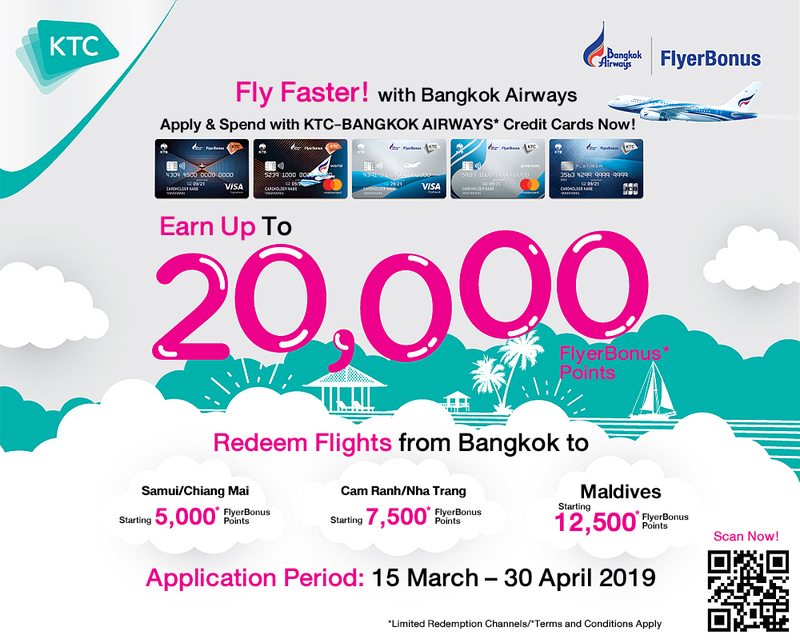 This promotion is reserved for new KTC-BANGKOK AIRWAYS credit card applicants (main card member) during 15 March – 30 April 2019 and spending until 1 August 2019 only. These bonus points are considered only one (1) maximum transaction amount and one (1) time transaction only. FlyerBonus points cannot be refunded, exchanged for cash or other rewards. This Bonus points do not count towards membership status. Extra Bonus Points for KTC-BANGKOK AIRWAYS MasterCard includes KTC X-BANGKOK AIRWAYS World Rewards MasterCard, KTC-BANGKOK AIRWAYS World Rewards MasterCard and KTC-BANGKOK AIRWAYS Platinum MasterCard. The transfer of FlyerBonus points can take up to 15 working days after Bangkok Airways has received authentication from Krungthai Card PCL. KTC and Bangkok Airways reserve the right to change the programme structure, rules, regulations, benefits and all other terms & conditions in whole or in part at any time with or without prior notice, even though change may affect the value of the points or awards already issued. Other terms and conditions are subject to Flyer Bonus terms and conditions. In the event of any dispute or argument, the decision by the Bank and FlyerBonus shall be absolute and final.